For many, game sequels usually mean bigger and better things, and Shin Megami Tensei: Digital Devil Saga 2 does not disappoint. The recently released Atlus title for the PlayStation 2 console will tie up this tale in a satisfactory manner, and hardly disappoints. RPG gamers looking for something different from the traditional Final Fantasy-type flair should give this game a fighting chance. Digital Devil Saga 2 takes place right where the original Digital Devil Saga left off. Serph, the protagonist, arrived in what he thinks is Nirvana, the paradise he and his friends dreamed of reaching in the first game. However, Nirvana is nothing like the heaven they imagined. 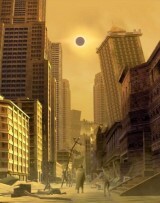 There are petrified human bodies littering the sun-scorched streets, with tilting structures and skyscrapers looming above. Serph soon discovers that most of the people in this world have the power to turn into demons just like he and his friends do, but they\'re not exactly the friendly type. It is in this hellish setting that Serph seeks to reunite with his friends, and eventually begin a quest to find Sera, the strange black-haired girl they befriended back in the Junkyard in DDS. I\'m sure all of this sounds pretty confusing. DDS2 will do its best to bring you up to speed with the plot if you haven\'t had the chance to play the first game. However, for the most enjoyment, it\'s best to play Digital Devil Saga first, then load completed save data to DDS2. Doing this will not only help you understand the plot, but it will also give you access to special features, including choice of difficulty, special items, and secret abilities. For example, taking the time to fight the secret bosses in the first game will reward you with exclusive karma rings not available to someone who did not bother to defeat them. The more perfect your DDS file, the more goodies you will receive. The gameplay remains pretty much the same in DDS2 as in the first installment; the party must crawl through several dungeons while fighting, and sometimes eating, demonic enemies and solving puzzles along the way (demon consumption is a requirement to learn new abilities for your characters). The sequel evolves these elements, building on the original. The most popular addition to the game is Berserk Mode, which increases power, but can become a deadly gamble with your party\'s lives. There are also new special encounters, but returning DDS players will be glad to hear Omoikane is back, as well as Jack Frost, who will challenge you to the new Hee-Ho Quiz. The characters still learn new abilities by mastering mantra, but this time the Mantra Grid has been changed into a honeycomb shape, and moves no longer have to be mastered in straight lines. For example, mastering a single mantra unlocks all of the mantra that surround it, giving you more freedom in learning new moves as you move about the grid. The only negative aspect of the new Mantra system is the price near the end of the game that makes it difficult to afford the higher-level mantras. However, if you take the time to earn the money, the abilities are worth it. Along with the traditional Ammo, DDS2 characters can now equip special items called Karma Rings, which are new to the game. These rings, which can be bought or found, raise stats and/or give special abilities and resistances to the wearer. The Karma Rings can be made even better by customizing them with accessory jewels. The dungeons of DDS2 can be tedious for those who find leveling up and/or random battles an annoyance, and sometimes you may experience delayed animation loading during battle. Fortunately, Save and Health Terminals are scattered throughout in appropriate locations to keep you from getting too frustrated after a tough battle or an unexpected party death. The story is one of the best elements of DDS2. There are pieces of plot exposed everywhere, whether it be through in-game cinemas, or just talking to people in the streets. The cinemas are much longer than in DDS2, and the plot is meted out little by little, leaving you wanting to find out more when each movie ends. The characters, both new and returning, are easy to sympathize with (and sometimes even despise) and DDS2 makes sure to give you the dirt on everybody. Fans may find themselves near tears at some points. Sound is where DDS2 receives some negative marks. Those who have played the Japanese version of this game or either version of Digital Devil Saga will notice it the most, but in-battle sound effects and character quotes have been softened ridiculously (or in some cases, completely muted). This can be a good thing, as many demons have very obnoxious sounds effects that they use when they cast spells. It can also be considered bad; you will need to turn up your volume to hear the battle quotes from party members at the start of some fights. There are also glitches in the English version where you\'ll hear Japanese lines instead of English ones. The voice acting has dramatically improved from the first game as well; the actors seem to have gotten used to their roles, and deliver a much better performance. Graphics get the best rating. Kazuma Kaneko\'s designs flourish in the 3-dimensional game world, bringing his surreal and haunting characters and creatures to life with style. The dungeons are beautifully rendered, and reward you for going out of your way to scour every inch of ground. The text is plain and simple and reads well among the game\'s action screens. The cinemas are high quality anime and are enjoyable to watch. If you\'re on the hunt for something different in the role-playing game genre, I highly suggest Digital Devil Saga 2. To get the maximum enjoyment from this title, I recommend going on a hunt for the original Digital Devil Saga before you do that. Here\'s hoping to see more good stuff from Atlus in the future!